While RC is away on family business, I figured I'd whet the readers of strangeculture with my contribution. I hate to beat a dead horse, especially when RC has mentioned Iron Man in at least 6 different posts, but I need to write something about the movie. I finally just saw it tonight -- just about two months after its release date. I'm a big fan of seeing it late because it usually means the theater is somewhat deserted and the escapism aspect of going to a movie isn't usually ruined for me. Also whenever I see a movie, I always think of my friends RC and Mark. They always find something about the movie that's sitting below the surface. 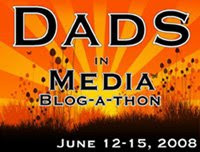 They are the dream audience for the writer, but would be terrible in a focus group. I ended up seeing the movie like RC and Mark this time. I'm not saying I can duplicate their thought process, but I sure can try to imitate it. President: Even if something like that really did exist, why do you think I would actually just give it to you? Ben Gates: Because it will probably lead us to the discovery of the greatest Native-American treasure of all time; a huge piece of culture lost. You can give that history back to its descendants. And because you're the President of the United States, sir. Whether by innate character or the oath you took to defend the Constitution or the weight of history that falls upon you, I believe you to be an honorable man, sir. President: Gates, people don't believe that stuff anymore. 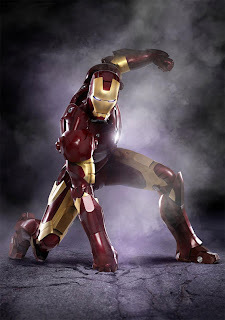 After seeing Redbelt and Iron Man, people are ready for the return of the real super hero. I found the Military Industrial Complex angle interesting. (Disclaimer: I'm employed by Lockheed Martin and I'm a reservist in the US Army). I didn't like how the villain was the head of a major defense contractor. I also found it a bit disturbing that part of the plot had Stark Industries selling the same technology to our enemies. One thing I did find amusing was the marketing and branding opportunities the fictional Stark Industries, decided to take on every single product no matter who they sold their weapons to. It was a marketing directors dream come true. I found that photo and others on screenrant.com. 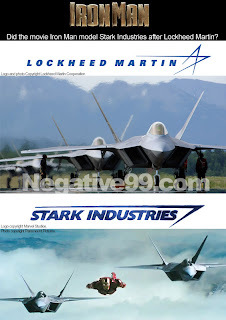 Also, the Stark Industries logo is a clear ripoff of the Lockheed Martin logo -- Steve Mooradian at negative99.com has a short writeup. I'm sure it was legal, but I don't know if knocking off a real defense contractor's logo and then making them look evil is ethical. Sure Lockheed may be building F-16's for the Pakistanis, but we want to sell some to India too!!! 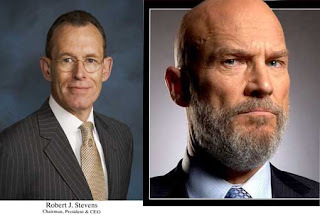 One last thing, is Jeff Bridges trying to look like Bob Stevens, the CEO of Lockheed Martin? I know the hair is different, but I can see a resemblance. It was also nice to see another movie where the American Soldier isn't the bad guy. There were a ton of Iraq War movies this winter that I didn't see along with the rest of America. This movie wasn't about soldiers, but at least we weren't depicted killing babies. If you haven't seen Iron Man, go see it. RC, hope you come back soon. You can read Adam regularly at the Stone Report. The whole weapons-trafficking-is-evil thing was my least-favorite part of the film. I mean, didn't anyone see the irony in building the world's greatest weapons in order to destroy weapons? Keep in mind that the whole "evil munitions dealer" is in keeping with the original comic (as far as I remember). Obadiah Stane did pretty much in the comic what he did in the movie. So, that particular part of the plot is nothing new. I totally just noticed the logo similarities. When I saw the movie back in May i remember thinking about the logo and how familiar it looked and then recentely, I randomly saw Lockheeds Logo in a book I was reading and made the connection. I agree that this has to be more than a coincidental spoof. While not identical there is a clear resemblance. As for legal ramifications...I think it would all depend on if Lockheed found it offensive enough for them to pursue a lawsuit with the studio.